Glass etching techniques can be used to make a number of interesting designs. If you're looking for design ideas for etching glass, you're not alone. Glass etching is a fun and enjoyable craft that is surprisingly versatile. Whether you're making a gift for loved one or a special treat for yourself, there are plenty of different project options to consider. 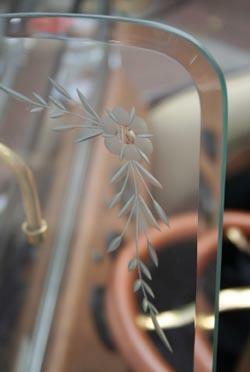 When choosing design ideas for etching glass, you should keep in mind a few basic points. How will the item be used? Keep in mind that the intricate etching design that would look beautiful on a hallway mirror might be hard to see on the door of a linen storage cabinet. If you'll be able to see what's behind the glass, simple designs are the best choice. If your project will be a gift for someone else, what design would go best in their home? Knowing whether your recipient has traditional or contemporary tastes will make it easier to select an appropriate gift. Etch a striped design onto the top of an old glass coffee table that has seen better days. Make a series of fun polka dots on a window to provide privacy without the need for expensive blinds or curtains. Hide your child's toys, board games, and craft supplies by stenciling a pretty star design on the front of a storage cabinet with glass windows. Jazz up an otherwise boring serving tray with some dramatic swirls. Make inexpensive party favors by etching simple heart graphics onto dollar store candle holders. Etch a subtle geometric border around the edges of the glass in a large picture frame. Add an apple motif to a set of drinking glasses to match your apple-themed kitchen. Decorate a mirror with a rose to give as a wedding or anniversary present. Etch a leaf border around a glass vase to make a dramatic container for a special flower arrangement. Stencil a bird design on a glass candle holder. Make an interesting display for your mantle by etching small flowers onto glass perfume bottles purchased from your local thrift store. Label clear glass jars to store flour, sugar, and other pantry staples in the kitchen. Monogram initials onto drinking glasses to make it easy for family members to keep their beverages separate. Label beads, ribbon scraps, and other supplies in your craft room. Personalize a dog treat jar with Fido's name. Add your family's name or your street address to your front window. Full of Great Ideas has a project about etching a glass vase. Martha Stewart has a tutorial that describes a technique for etching monograms on glass.